The "new Nokia" has made a habit of announcing loads of phones at the Mobile World Congress in Barcelona every February, and unsurprisingly, this year is no exception. But while the brand's MWC 2019 lineup even includes a US-bound flagship device with an insane five-camera array on its back, the best mid-ranger you can buy is still the Nokia 7.1. Released just a few months ago at a recommended price point of $350, the notched 5.8-incher can be purchased for 50 bucks less right now from a number of authorized US retailers. Best Buy has it at $299.99 in a blue shade, B&H Photo Video charges the same three Benjamins for the same color option with an extra tempered glass screen protector thrown in, while the "gloss steel" variant is available at Newegg for $50 off alongside a free Bluetooth speaker. Those gifts aren't typically very expensive, mind you, costing around 20 and 10 bucks respectively, but they're certainly better than nothing. 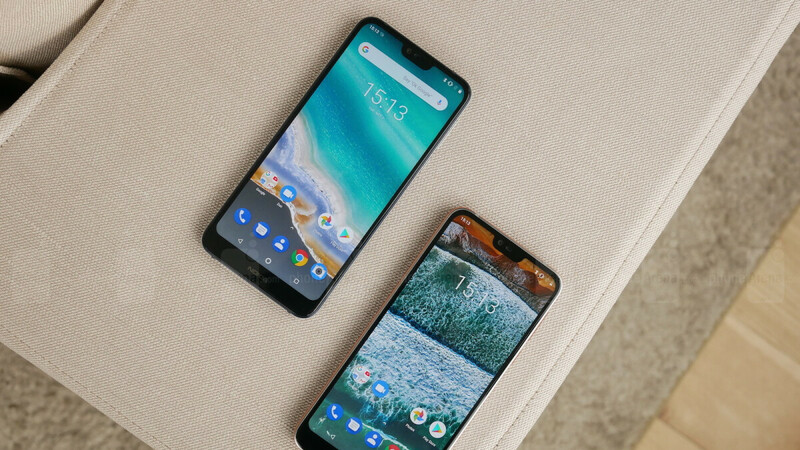 And the Nokia 7.1 is a solid bargain at $300 anyway, running Android 9.0 Pie on the software side of things with minimal proprietary "optimization", and packing a respectable Snapdragon 636 processor in conjunction with 4GB RAM and 64 gigs of internal storage space. Made from premium metal and glass, the mid-end handset sports a high-quality "PureDisplay" with HDR playback support, as well as dual rear-facing cameras with 12 and 5 megapixels, Zeiss optics, and depth-sensing technology capable of producing "effortless bokeh blur." The 3,060 mAh battery is no featherweight either, considering the relatively energy-efficient SoC under the hood of the Nokia 7.1. Unlocked for unrestricted use on GSM networks like AT&T and T-Mobile, this very reasonably priced, reasonably powerful phone also comes with a standard US warranty wherever you might choose to buy it from. Well, at least as far as these three retailers are concerned. Such a capable midrange Nokia branded smartphone from HMD. Build quality, camera, up to date software and stock Android makes this one of the best midrange smartphones out today, IMO. I think I might just cop this jawn. The Nokia 9 Pureview just seems meh to me so far. I'm disappointed that it doesn't have an LCD screen, micro SD card support, and a headphone jack. Seriously OEMs need to stop with the eliminating of the headphone jack. The camera alone on the Nokia 9 Pureview makes more than “meh”. The screen technology used is great as well. The phone that you claim is “the best phone ever”, the 6T, doesn’t have a headphone jack either, but you still say it’s the “best phone ever”. Your “best phone ever” also isn’t universally unlocked either, just so you know, but I think I’m going to cop that jawn in addition to the awesome N9PV. Ok? So what exactly is the problem here besides you with an excess amount of salt? First of all I never said nor implied anything about "universally unlocked" so what are you crying about? I'm aware that the 6T doesn't have a headphone jack which is why I said OEMs need to stop eliminating it. Maybe you should have read my comment first. I don't really see why you are whining just because I said the Pureview was meh to me. I didn't say it was meh as a general statement. I said it as a reflection of my own opinion. I don't even know why you are so triggered. The only one with excess amounts of of salt here is you, because of my response. Stop being dramatic. You’ve always championed unlocked to work on all carriers, or “universally unlocked”. All I did was state the obvious, you’re the only one shedding tears because of it. If the headphone jack is a negative to you about the Nokia 9 Pureview, which is one of the reasons why you say it’s “meh”, then the OnePlus 6T, by your logic, is “meh” because of it as well. However, you still claim it’s the “best phone ever”, which is hypocritical of you. Maybe you should rethink your reasons of “meh”. I really don’t see why you’re being so defensive and dramatic over my response to you. I didn’t attack you or say anything disrespectful or name call like you did with me. I merely stated a reflection of my own opinions to you. I don’t know why that has you so triggered. You're crying just because I said the Pureview wasn't for me. Grow up. No one said anything about unlocked phones here. All you did was state a useless comment. No, that's not the sole reason why I said it was meh. I don't have to put the Pureview on a pedestals and praise it like you are doing. The OnePlus 6T is just a great phone, but that doesn't mean that I agree with it not having a headphone jack hence why I said what I said above. No you once again started to get overly aggressive trying to shove your ridiculous gospel down other people's throats. I don’t care about what is and isn’t for you. Stop being so dramatic because I mentioned that the Pureview camera isn’t “meh” based on the photos shown that were taken with it. I never said anyone did say anything about unlocked phones here. Stop changing the facts to suit your false narrative. I never said you did say it was the “sole” reason for you saying it’s “meh”, but the Pureview has the same if not better specs than the 6T. I refuse to put the 6T on a *pedestal like you do when there are smartphones like the Pureview that beat it in certain aspects. The Pureview has shaped up to be a great smartphone, with the supplied photos that were taken with it being phenomenal, and the initial benchmarks putting it at or just a tad better than some of the greatest SD845 using flagships available. You’re being dramatic by saying anything about me being any type of aggressive. You’re just offended and want to pick a fight because I posted some facts concerning your comment, as opposed to letting you shove your ridiculous gospel down other people’s throats. I didn't say the camera was meh. Reading comprehension apparently isn't fundamental to you. You don't care about anything other than your own biased opinion, we already know that. So why did you bother mentioning it then? Stop with the strawman logic. Good for you. Go stick it on a fridge if it's that important to you. I happen to not be impressed with the Pureview. I didn't say any phones were better or worse than it. I just said that I was going to stick with the 7.1. You are the one who brought up the 6T and now you're trying to justify your blatant trolling. Keep it up though because the cheap laughs at your expense goes great with beer. Lol I gave my honest reasons why I didn't want to get the Pureview in addition to praising it and you still b**** about it. You are the one who is being aggressive here shoving your gospel down people's throats. I never said you did say the camera was meh. Reading comprehension isn’t your strong suit. You only care about your biased opinion, we already know that. Because I felt like it. Now stop changing the facts to suit your false narrative. Lmao the only reason you’re saying that you’re not impressed with the Pureview is because you thought it would fail or be DOA, and it was neither. You won’t admit that, so you stick to your cop out answer of “I wasn’t impressed.” Yes, I brought up the 6T, just like you brought up the Pureview, of which this article is about neither. Now you’re yelling “troll” because I posted facts, when it’s you that’s claiming to have have ordered a Nokia 7.1 so you can justify your incessant trolling of HMD. Everyone knows that’s your MO, which is why most people ltmfao @ you whenever you say things like that. Lmao you’re being dramatic because it’s me that responded to you with my opinion, and now you want to btch and pick fights because of it. You’re being aggressive for no other reason because what I said doesn’t gel with the BS you shove down people’s throats here.